The Honda Shop Referral Program has been designed as a way to reward you for sales leads. When you hear about someone looking to buy a new bike we want to know about it and you can earn some extra cash! We are the biggest ATV dealer in WA with 38 years experience and the best deals on new Honda’s. Farm finance and personal finance options to purchasers makes buying with The Honda Shop in Midland easy. When a client, friend or relative is looking to purchase a new Motorcycle, Quad Bike or Side-by-Side mention The Honda Shop in Midland and ask if you can share their details with us. 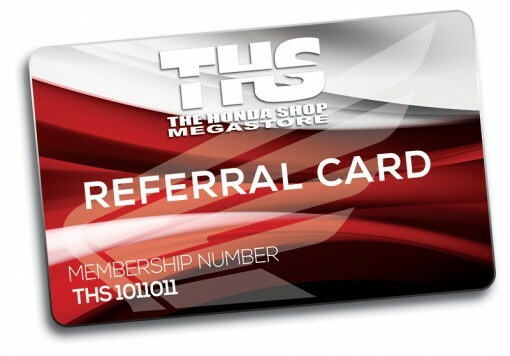 The Honda Shop Referral Program will pay 1% of the final purchase price to you simply for sending us a valid referral. For example, if your referral results in a $10,000 motorcycle sale you get $100! When will I be paid for my referral? Referral payments will be processed by our rewards team following delivery of the vehicle to the customer. You will receive a phone call to confirm your account details prior to a direct bank transfer. Processing can take up to 30 days from the time of delivery. I sent my mate in and they bought a bike the other day, can I get paid for that? Referrals need to be submitted online and confirmed before negotiations with the sales person commence. Can't I just call through referral details? In order to ensure fairness, all referrals are paid on a first submitted – first paid basis. This can only be done by entering referrals through our online submission system. Once submitted you will receive a confirmation email which helps to avoid any discrepancies. I lost my Referral Card, can I get a new one? Click here to enter the referral details in the Customer Referral Form. We do the rest. If they buy from us, you get paid. Easy as that!